Report about police time and resources devoted to making marijuana possession arrests since Bloomberg became Mayor, released by Drug Policy Alliance and The Marijuana Arrest Project. Includes numerous excerpts of responses to NYC's possession arrests from 2007 to 2013. • Bloomberg's Marijuana Arrest Crusade is ... Softened? Testimony by Harry Levine to Hearings of the New York City Council, October 2012. Regarding proposed legislation with photos of illegal police searches and discussion of the summons court system which will handle the decriminalized marijuana possession charges. Report released with the Drug Policy Alliance about the cost of arresting 50,000 people a year. By Harry G. Levine, Jon Gettman & Loren Siegel. Oct 2010. Report released with California NAACP and the Drug Policy Alliance about arrests of blacks for marijuana possession in 25 California cities where blacks are arrested at 4, 6, 8 and even 12 times the rate of whites. 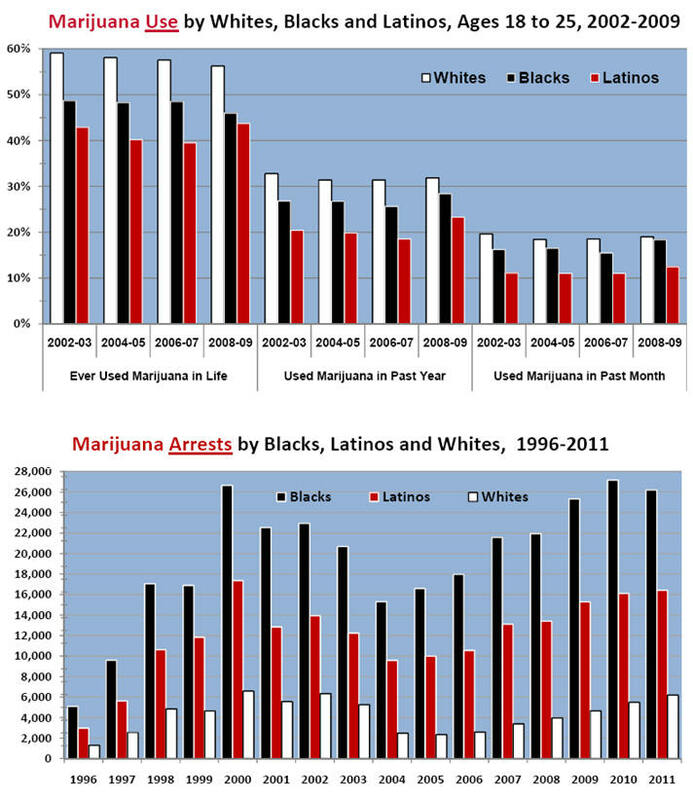 • Arresting Latinos for Marijuana in California, 2007-2009: Possession Arrests in 33 Cities. Report released with William C. Velasquez Institute, a Latino civil rights organization, about the disproportionate arrests of Latinos for marijuana possession in 33 California cities. Report released in conjunction with the California NAACP and the Drug Policy Alliance about arrests of blacks for marijuana possession in the 25 largest counties in California. Oped summary of arrests in NYC and other cities. New York Civil Liberties Union (NYCLU) report, 100 pages, graphs and detailed description of the arrests. Source: Click here for tables with full source information. • In New York City since 1997, for twenty years, 85% of the people arrested for marijuana possession have been blacks and Latinos. The New York Police Department has arrested blacks for marijuana possession at seven times the rate of whites, and has arrested Latinos at nearly four times the rate of whites. Yet, U.S. government studies have consistently found that young whites use marijuana at higher rates than young blacks or Latinos. 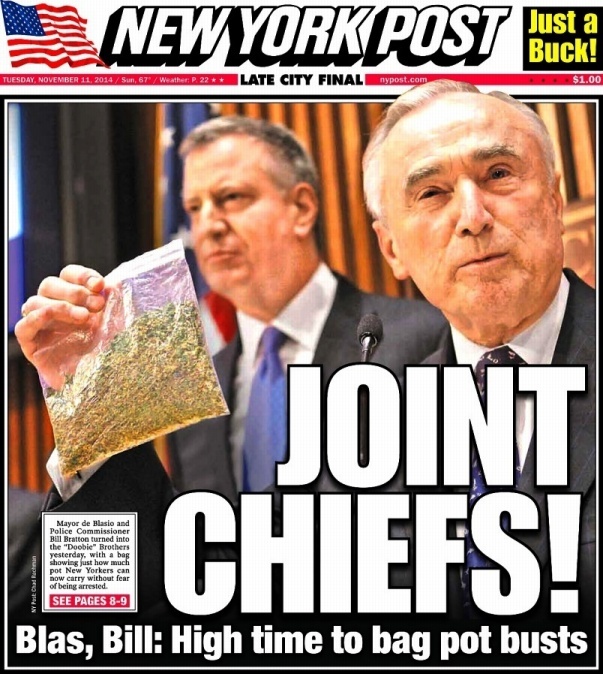 • It has cost New York City up to $75 million dollars a year to arrest and jail people simply for possessing marijuana. • Most people arrested for lowest-level marijuana possession in New York City are young: 23% of the people arrested are teenagers; 55% are under 25 years of age; and 68% are under 30 years of age. • The marijuana arrests target people who have never been convicted or even arrested before. Of the hundreds of thousands of people arrested for marijuana possession in New York City: 30% had never been arrested before for anything; another 41% had never been convicted or plead guilty to anything, not even a misdemeanor. Mostly the charges were dismissed or dropped. In other words, 71% of the people arrested for marijuana possession had never been convicted of any crime whatsoever. Another 11% had a previous conviction only for a misdemeanor. • Since 1977 and the passage of the Marijuana Reform Act by the state legislature, the possession of 25 grams or less of marijuana (7/8th of an ounce) has NOT been a crime in New York State. Under New York State law, possession of a less than an ounce of marijuana is a violation, like a traffic violation. • Most people arrested for marijuana in New York City were not smoking marijuana or did not have marijuana in public view. Most people simply had a small amount buried in their pockets or belongings. Most of the arrests were made as a result of a police stop. Police officers either tricked people into taking out their marijuana, ordered them to do so, or illegally searched their pockets and belongings. • The marijuana possession arrests do not reduce serious crime or violence, but they are very useful for significant groups within the police department. The arrests are relatively safe and easy, provide training for rookie police, and allow patrol and narcotics officers and their supervisors to meet arrest quotas and make overtime pay. They produce records of police activity and help supervisors keep track of what officers are doing. The arrests are also the most effective way for the NYPD to collect fingerprints, photographs and other information on young people not yet entered in the criminal databases. 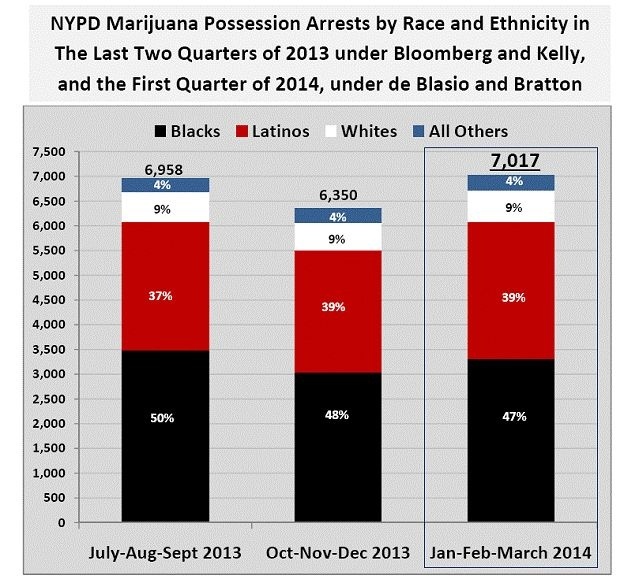 • New York City's racially-biased marijuana arrests are extreme, but they are not unusual. Large cities and counties throughout the United States arrest blacks and Latinos for marijuana possession at three, four, five, and up to ten times or more the rate of whites. Chicago and other major cities arrest blacks at seven times the rate of whites, just as New York City does. Along with DNA collection for misdemeanors and other policing policies, this produces an institutional form of unjust discrimination that some have termed "racism without racists." The law professor Michelle Alexander has rightly described this as "the new Jim Crow."